her obsession with love in a raw, racy and hysterical one-woman show. All seemed to be turning around when she saw a Craigslist post from Josh. in June as part of the Hollywood Fringe Festival. Unable to bear the death of her soulmate Sophie, Gabriella will do anything not to feel the pain from the loss of … her cat. Seven days later, Gabriella contacts a fellow named Josh on Craigslist, hoping he can fill the void. This zany and racy romp juxtaposes sadness and madness to comedic effect, tracing the broken-hearted heroine's descent into near-insanity and back with candor, vulnerability and humor. Written by DeMarco and directed by acclaimed solo-show artist Jessica Lynn Johnson, the show chronicles her journey through grief, trauma, longing, obsession, shame and all the shocking things people will do in the pursuit of love. Lovesick is rated “Rx” –that is R, with a little bit of X -- and promises to be a prescription for those who have experienced the pain of love. Serving as a catalyst for DeMarco’s story are the cats in her life and her need to adopt another one -- a transfer of her obsession after a devastating event pushes her away from dating. 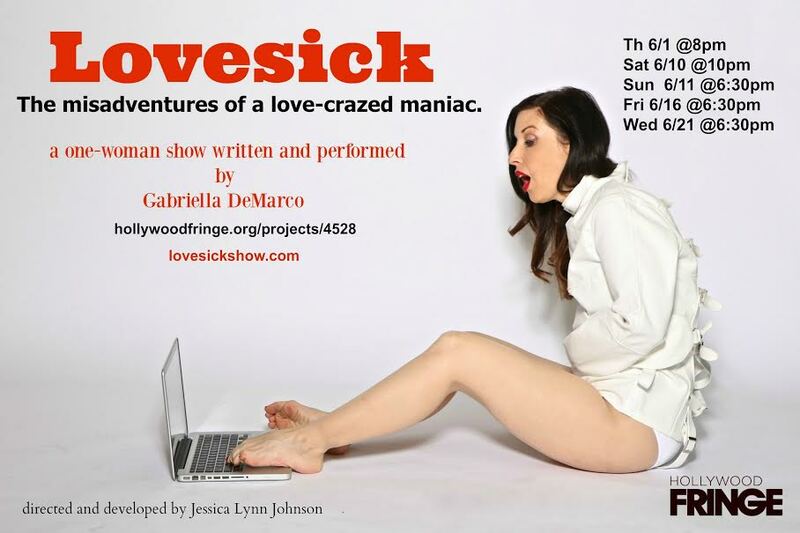 Lovesick takes on a deep and often dark topic like addiction with a strong dose of humor. DeMarco is a professional stand-up comic who has won or placed in several comedy competitions. She has also performed her comedy in New York and internationally. including on tour in Scandinavia. Growing up in Stockton, Calif. with her father, a Vietnam vet who suffered from PTSD, a depressed mother and a brother addicted to meth, DeMarco also struggled with self-image issues and cultivated a reputation for trouble from friends’ parents, to whom she was known as “that girl.” She considers herself a survivor and wants to share what she’s learned in seeking catharsis with others dealing with issues of their own.